Core-shell magnetic metal organic nanocrystals were synthesized and used as matrix for matrix-assisted laser desorption/ionization time-of-flight mass spectrometry (MALDI-TOF MS). 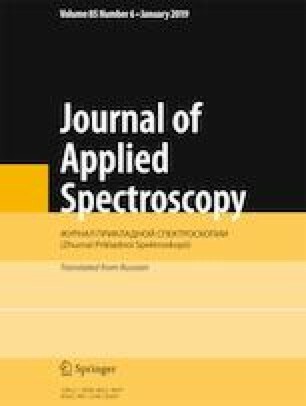 Four nitropolycyclic aromatic hydrocarbons (nitro-PAHs) were successfully detected by using negative-ion MALDI-TOF MS without background interference. Furthermore, the magnetic nanocomposites (MNCs) coated with zeolitic imidazolate framework-8 (ZIF-8) showed excellent adsorption and enrichment capacity, and can be isolated with a magnet and directly spotted on the stainless steel plate for MALDI measurement. It was also analyzed nitro-PAHs in PM2.5 samples using the ZIF-8-coated magnetic nanocomposite as adsorbent and matrix. Published in Zhurnal Prikladnoi Spektroskopii, Vol. 86, No. 1, pp. 103–109, January–February, 2019.